Need more pop or boom? A crispier hi-hat sound or pounding bass? Equalization is the key getting the perfect sound from your system. With EQu, shape your sound to match a particular style, your mood and your acoustic environment. It is really easy to use. Just play your own music from your iPod library and adjust it the way you want. Or use the build in presets. Make your own presets for your car or living room. Your music will sound as you like it! And EQu is more than that. Whereas conventional equalizers allow you to amplify or attenuate predefined bands, with EQu you can design an extremely precise and smooth frequency response by directly manipulating more than 1000 discrete bands. EQu’s linear phase design also preserves all of your music’s fidelity and introduces no spatial distortion. Put your finger on the line and slide up or down. You’ll see the line changing into a curve and you have added a sphere to the curve. The sound and the spectrum will change instantly. 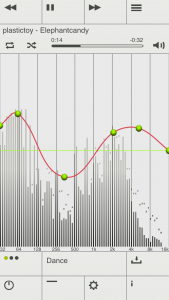 Moving the right side of the curve upwards means boosting high frequents. Moving the left side of the curve upwards means boosting the bass. 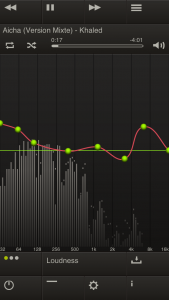 By adding more spheres you can make complex curves and shape your sound very precise. Moving one sphere over an other will delete that sphere. Pushing the ‘flat’ button will bring you back to the original sound and curve. If you touch the main screen outside the curve you can move the total curve up or down with a vertical movement. When you do the same horizontal you can move all spheres at once to the right or the left. Pinching the screen with two fingers lets you flatten or exaggerate he curve. This can help you to make really detailed curves. 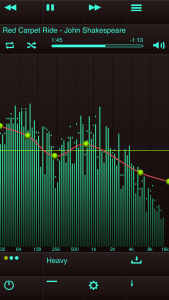 Press the bypass button to compare the sound with the original (flatline) sound. The bypass button will turn red to warn you that you wouldn’t be able to hear changes made in the curve. By saving your curve it will appear in the list of presets next to the existing ones. You can customize the main screen of EQu in the settings. Choose your own color scheme and make EQu play in the background just like you are used to with the iPod app. Stop buying expensive headsets and try this app… It has good bass and you can customize it the way you like it. I’m using the earphones that come with the i5 and they sound like the UE10i, I had before. This is the equalizer to get. Nuanced freq control. Distortion I.D. Save presets. Can listen to streaming equalized music via Tune In (gotta pay couple of bucks extra but I like the variety of music available) Many other features. Makes your cheapie phones sound so much better. One blogger thinks Apple would be wise to buy up this company and absorb this app into their iDevices. I believe in supporting good developers. They certainly are! If you have any comments, requests or bugs to report regarding EQu, please contact us.